More than just muscle, the 1794 Edition CrewMax represents a leap forward in full-size truck luxury. This is everything you want in a premium truck, maybe more. Every part of the interior has been refined from the feel of the buttons, to the stitching, to the sweeping instrument panel. The Platinum CrewMax excels at transporting passengers in the lap of luxury. As you slide into the premium seating surfaces and feel the soft-touch materials that surround you, you’ll appreciate a vehicle that’s as comfortable as it is capable. Opt for available front bucket seats, and you’ll get a center console with a covered storage compartment plus a 12V auxiliary power outlet. Great power and efficiency. Two ways to deliver it. To handle the torque of Tundra’s available i-FORCE 5.7L V8, our engineers fitted the rear differential with a massive 10.5-inch ring gear. This allows use of an aggressive 4.30 rear axle ratio to help amplify and transfer the 401 lb.-ft. of torque the 5.7L V8 produces to the ground. Tundra’s 4.6L V8 is packed with tech, delivers 310 hp and 327 lb.-ft. of torque via a 6-speed automatic transmission. It also benefits from Double Overhead Cams, a 32-valve head design and Dual Independent Variable Valve Timing with intelligence (Dual Independent VVT-i), so all the power you need is ready when you need it. Standard on all Tundras, Auto LSD4 works like a traditional limited-slip differential—with a high-tech twist. Instead of controlling slip mechanically, Auto LSD applies brakes individually to wheels with no traction. And unlike Traction Control, it doesn’t cut engine power. This helps give you control and distributes power where it’s most effective. Best of all, because the system utilizes the brake system, there are no extra components that add to overall ownership costs. 1 Based on manufacturers’ data. 3 The 2012 Tundra CrewMax 5.7L V8 is towing far beyond its published towing capacity in a one-time, short-distance event. Never tow beyond a vehicle’s published towing capacities. Always consult the Owner’s Manual. 4 Auto LSD is an electronic, brake-actuated limited-slip differential that automatically activates when VSC is disengaged at low speeds. 5 Before towing, confirm your vehicle and trailer are compatible, hooked up and loaded properly and that you have any necessary additional equipment. Do not exceed any Weight Ratings and follow all instructions in your Owner’s Manual . The maximum you can tow depends on base curb weight plus the total weight of any cargo, occupants, and added vehicle equipment. “Added vehicle equipment” includes additional standard/optional equipment and accessories added by the manufacturer, dealers, and/or vehicle owners. The only way to be certain of your vehicle’s exact curb weight is to weigh your vehicle without passengers or cargo. With features like staggered, outboard-mounted shocks, heavy-duty TripleTech™ frame with integrated towing hitch receiver—plus a trailer hitch that utilizes 12 high-strength bolts integrated into the frame—Tundra’s i-FORCE 5.7L V8 has the available brawn to help you tow over 10,500 lbs.1 A combination meter—which includes a voltmeter, coolant temperature, fuel and engine oil pressure gauges—helps you keep an eye on your Tundra’s vitals. And Tundra has been SAE J2807-rated since 2010—adopting the standard tow ratings as set by the Society of Automotive Engineers (SAE). The workday doesn’t stop for gas, and neither do you. With Tundra’s available 38 gallons fuel tank, you can rest assured that you’ve got the fuel you need for life’s longer hauls. Tundra’s 4-/7-pin connector is integrated into the rear bumper and is ready for any compatible trailer. So all you have to do is hitch up, plug in and haul out. There are more ways to tow jumbo toys, including TOW/HAUL Mode with the available 5.7L V8. 1 It intelligently holds lower gears longer, so Tundra won’t keep shifting or “hunting” for the right gear when towing. This system also increases throttle response, pulling power and engine braking, helping you tow with confidence. Big trucks tow big toys, which is why Tundra’s available Integrated Trailer Brake Controller2 and standard Trailer-Sway Control (TSC)3 are so important. These features not only let you adjust the amount of trailer braking based on the weight of the trailer,* they also detect trailer sway and apply brake pressure at individual wheels to help keep everything stabilized. *Compatible trailer required. 2 The Integrated Trailer Brake Controller is an electronic system that operates in tandem with a properly equipped trailer with an electric braking system. It is designed to help the driver maintain trailer control by increasing or reducing trailer braking based on trailer weight. It is not a substitute for safe towing practices. Factors including speed, road conditions and driver input can all affect trailer braking control. See Owner’s Manual for additional limitations and details. As the first full-size pickup to offer Blind Spot Monitor (BSM)1 and Rear Cross-Traffic Alert (RCTA),2,3Tundra continues to redefine the segment. When the available Blind Spot Monitor (BSM) detects a vehicle, it illuminates a warning indicator on the appropriate outside mirror to alert you to the presence of another vehicle, helping you to determine when it’s safe to change lanes. Rear Cross-Traffic Alert (RCTA) works in much the same way. When you slowly back out of a driveway or parking spot, it provides audible and visual indicators to help warn you of approaching vehicles. Tundra comes equipped with driver and front outboard passenger airbags, side curtain and front seat-mounted side airbags. And only Tundra has driver/front outboard passenger knee airbags.7 No other truck has that. Toyota is devoted to safety and dependability, and proper vehicle maintenance is important to both. 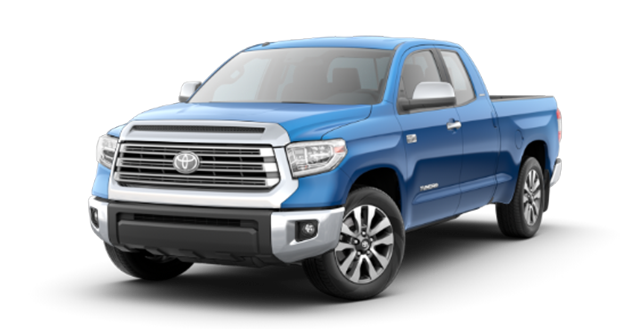 That’s why we include a no cost maintenance plan8 with the purchase or lease of every new Tundra for 2 years or 25,000 miles, whichever comes first. 24-hour roadside assistance9 is also included for 2 years and unlimited miles. 3 Based on manufacturers’ data. 6 Smart Stop Technology® operates only in the event of certain contemporaneous brake and accelerator pedal applications. When engaged, the system will reduce power to help the brakes bring the vehicle to a stop. Factors including speed, road conditions and driver input can all impact stopping distance. Smart Stop Technology® is not a substitute for safe and attentive driving and does not guarantee instant stopping. See Owner’s Manual for details. 7 All the airbag systems are Supplemental Restraint Systems. All airbags (if installed) are designed to inflate only under certain conditions and in certain types of severe collisions. To decrease the risk of injury from an inflating airbag, always wear seatbelts and sit upright in the middle of the seat as far back as possible. Do not put objects in front of an airbag or around the seatback. Do not use a rearward-facing child seat in any front passenger seat. See Owner’s Manual for further information/warnings. 8 Covers normal factory scheduled service for 2 years or 25K miles, whichever comes first. See Toyota dealer for details and exclusions. Valid only in the continental U.S. and Alaska. 9 Roadside assistance coverage is 2 years unlimited mileage. See Toyota Dealer for details and exclusions. Valid only in the continental U.S. and Alaska.